The Argentine’s left foot still works just fine. “It has been a long time out with injury for him, but he has not forgotten how to play,” Barca captain Carles Puyol told Spanish TV station Atena 3. Barcelona boss Gerardo Martino also had Saturday’s upcoming top of the table clash away to Atletico Madrid in mind as he made had made six changes to the side that started last weekend’s 4-0 win over Elche. 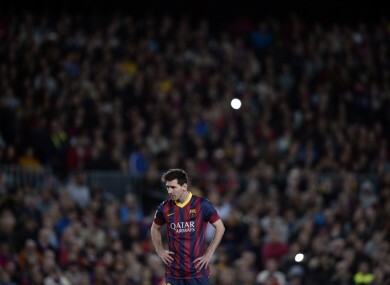 And despite such a stunning return, Puyol isn’t convinced Messi will start at the Vicente Calderon on Saturday. “We are not playing for the league because there is a long way to go, but it is a game against one of the best teams in the world. Martino’s selection proved inspired as Pedro’s lobbed cross was expertly headed into the far corner by Fabregas after just eight minutes. However, Getafe then managed to stifle Barca from creating too many clear-cut chances before the break and indeed the hosts were grateful to a great save from Jose Manuel Pinto to turn away Juan Rodriguez’s header to go in ahead at half-time. Barca did finally have the breathing space they craved when Juan Valera upended Pedro inside the area and Fabregas blasted the resulting penalty into the top corner. That set the scene for Messi’s arrival and he didn’t disappoint as he calmly slotted home a loose ball inside the area with his trusted left-foot after Martin Montoya had burst into the Getafe box. The best was still to come, though, as Messi embarked on a trademark run through the Getafe defence before slamming high past Jordi Codina to leave next week’s second leg in Madrid a formality. Email “Messi wastes no time, scoring twice on return from injury”. Feedback on “Messi wastes no time, scoring twice on return from injury”.